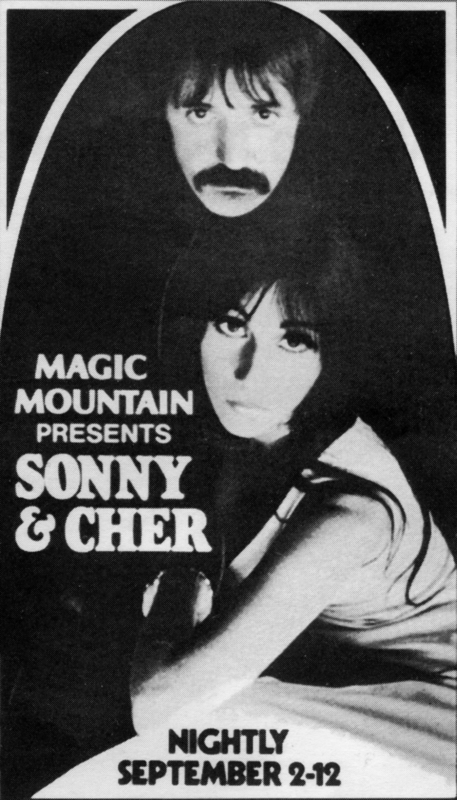 Pop stars Sonny & Cher performed nightly from Sept. 2-12, 1971, at Magic Mountain's 7-Up Showcase Theatre (later called the Golden Bear Theater). Magic Mountain was no slouch when it came to booking top acts. Sonny & Cher were big stars; earlier in 1971, "The Sonny and Cher Comedy Hour" debuted on CBS as a summer replacement series. It lasted four seasons and garnered 15 Emmy nominations. And the Santa Clarita Valley wasn't exactly unfamiliar territory. Not only did Sonny & Cher own property in the SCV; Cher was also the great-granddaughter of Placerita Canyon homesteader Frank Walker, and she visited her grandparents there as a child. Further reading: Sonny & Cher Bono's Placerita Canyon Property.